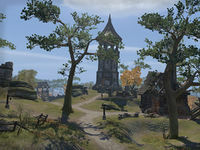 Cumberland's Watch is a fort in central Stormhaven, north of Wayrest. The fort has been overrun by the goblins from the Stonechewer Goblin Camp, whose tribal totem inexplicably appeared at the top of the fort's tower. The book Sacred Rites of the Stonechewers can be found inside the northern watchtower, near Pierre Lanier. Cumberland's Watch Objective: Defeat the goblins who overran Cumberland's Watch. This page was last modified on 2 April 2019, at 08:41.